NHL News : Rumor: Red Wings primed to be a trade partner for the Bruins. Rumor: Red Wings primed to be a trade partner for the Bruins. Bruins and Red Wings could link up for a trade. The National Hockey League's trade deadline for the 2018 - 2019 NHL regular season is drawing very close indeed and with roughly 2 weeks left to go before trades are shut down for good for the remainder of the season team's are scrambling to find the best deals they possibly can before the sand runs out in the hourglass. One of the teams that has been linked to a large number of trade rumors is the Boston Bruins organization. The Bruins have been linked to a number of players including Artemi Panarin of the Columbus Blue Jackets, Wayne Simmonds of the Philadelphia Flyers and even Micheal Ferland of the Carolina Hurricanes and with the sheer number of rumors out there connecting the Bruins to forwards it seems like Bruins general manager Don Sweeney has a clear plan in mind. It's become rather obvious that the Bruins feel they need another forward to compete in the playoffs and when you consider that they added forward Rick Nash before last year's deadline, who they then lost due to a forced retirement, it makes sense that they would look to fill that gap once again. Although there are some huge names out there available the cost on players like Artemi Panarin may be prohibitive for Don Sweeney who likely will hesitate to give up a king's ransom after how the Rick Nash deal worked out last season. One Bruins insider believes however that the Bruins may have a slightly lesser target in their sights, one that would almost certainly cost them only a fraction of the price to acquire. In a recent report for the Boston Globe Bruins insider Kevin Paul Dupont suggested that general manager Ken Holland and his Detroit Red Wings could make for an ideal dancing partner for Don Sweeney and the Bruins. Detroit GM Ken Holland made clear to NHL.com that he’s ready to shake out the Winged Wheel sock drawer, willing to entertain offers on almost anyone — though don’t bet on him moving youngsters Dylan Larkin, Andreas Athanasiou, Anthony Mantha or Tyler Bertuzzi. 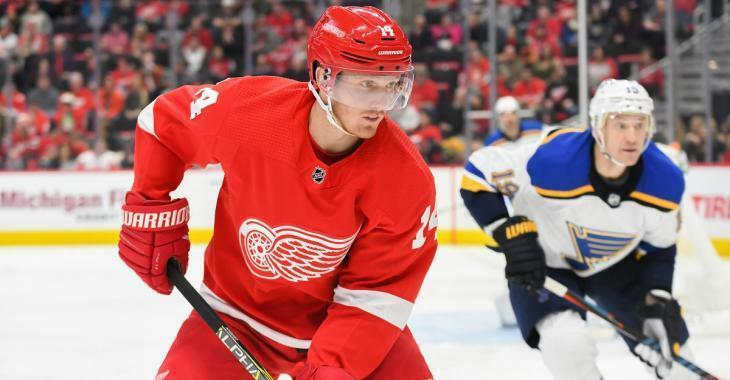 A couple of names in Hockeytown that could be of interest for the Bruins: upcoming UFAs Gustav Nyquist and Thomas Vanek, both of whom would be candidates for second-line duty. I can't see a world in which Vanek would be the guy the Bruins would go after, he's in the latter stages of his career and has always proven to be a very streaky player throughout his career. Should he find himself on a cold streak after being acquired it could spell disaster for the Bruins and I suspect Sweeney is acutely aware of that fact. Nyquist on the other hand would be an ideal fit in many ways. The cost for the Bruins would be kept relatively low, although Ken Holland did extract a massive price when he traded Tomas Tatar to the Las Vegas Golden Knights, and Nyquist would fit in well on the left side of their 2nd line. He has produced 13 goals and 33 assists this season for a total of 46 points in 55 games which is pretty solid given how the Red Wings have struggled at times this season. There are some sexier names out there to be sure, but this is one option that the Bruins could manage to snag without having to give up a prime asset in return.